Yesterday I had my last Summer Friday of 2010, but I made the best of it. I met up with good friends John and Robert in Queens to play the fastest growing lawn game in America: Mölkky. 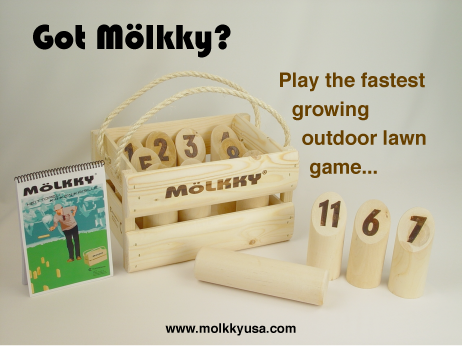 Out of Finland, Mölkky is an extremely addictive hybrid of Darts, Bocci Ball and The Price is Right. For a very creepy video of some gameplay click here, for actually information visit Mollkyusa.com. On the way to the park John was explaining how last night he had watched a free dance concert at Lincoln Center and that the James Taylor Dance company was really great. Robert and I laughed, and Robert asked if he meant the Paul Taylor dance company. John did mean Paul Taylor, but I kept thinking about modern dance set to James Taylor music and was like: hell yeah. I love slips like this. I think it’s so funny when people misremember, or replace a name with something more familiar to them. And oddly, the first example of this from television that i could think of was Tim Allen in Home Improvement. 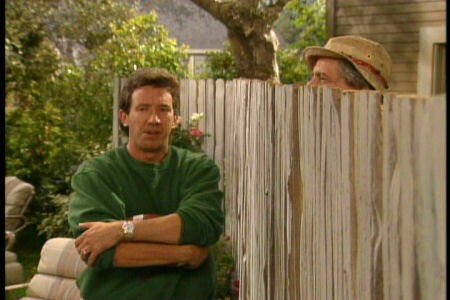 About once per episode he would have a conversation with Wilson over the Fence. Wilson would talk wisely about thespians and reincarnation. Moments later Tim would come inside and in a very knowledgeable tone tell his wife about how he might be re-incinerated and come out a lesbian. (I actually cracked myself up just typing that). Now, all of this thinking about Tim Allen reminded me of a magazine article I read a long time ago in which they ranked the funniest people alive (or on earth, or something like that) and Tim Allen was #3. I also remembered that Jim Carey was #1, and the cast of friends collectively was #7. I figured that this has to have been an entertainment weekly article, so I visited their main site and started flipping through there archives… what a trip that is! looking at the EW covers moving backwards. I passed cover stories on: Tom Welling, the first Harry Potter movie and the first Survivor, Twister, and Mark Wahlberg back when he was still Marky. Names in red appear on both lists. why such major turnover? and what was the secret to Ellen, Dave and Conan’s staying power? I suppose one big catch in this research is that we are trusting EW to tell us who is funny, and they can’t keep publishing the same list… that would be idiotic. But assuming they even somewhat represent the trends of the time – we are a finicky bunch. Attractiveness clearly changes with age. I think it’s more understandable to say that someone used to be hot rather than they used to be funny. Are our comedy taste so different now? Are we changing the definition or do funny people just lose it?